Back in May, I had a funny (or not…) experience at McDonalds on my way to work. I wrote a blog on it because I felt it to be blog worthy. Last week I was looking at Blog post stats on my blog. The stats are a little scale that shows you how many times your blog has been looked at in a given day, week, month… it also tells you which blog posts are being read. Then I went to the image pages and seen that many people have used McDonalds images and what they were saying was pretty intense compared to my silly little post. And then – after 4 days of receiving a total of over 750 hits on this sad lonely blog I tracked down that it was coming from Google pictures and my McDonalds picture was #3 on the Google “McDonalds” image page. I was told this was an amazing accomplishment. I still think it was wierd. And now… its over. I go to Google Images and I can not even find my McDonalds picture in the first 30+ pages. 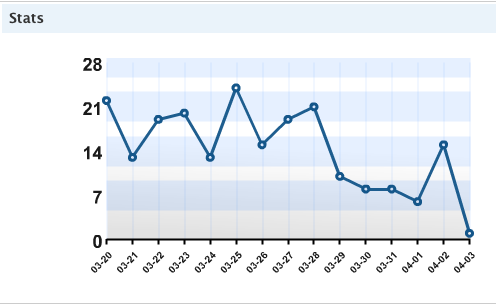 My blog stats have settled to normal hits. And I am left with the funny memory.